Booster hose is mounted on the fire engine to provide a solid, straight stream of either water or foam (not for use with air). Our Reeltex provides many advantages over traditional rubber fire truck booster hose as it is lightweight, flexible, kink resistant, and much easier to handle. It can be installed on reels or also used as a flexible, non-kinking water supply line in rough tundra or forested areas. On special request, we can supply the traditional rubber (NL9605 400 psi or NL9606 800 psi) in long lengths. 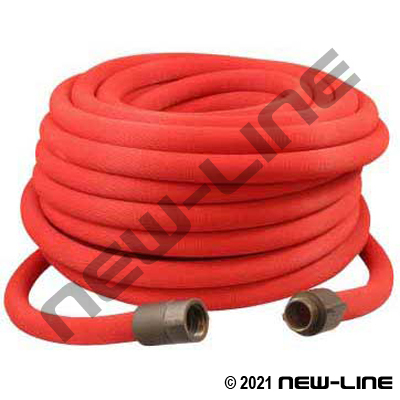 We also offer a non-FM/UL water line hose in Red NL9615 (300psi) & Yellow NL9620 (600psi) which are similar in construction to genuine NL9610- Reeltex Fire Booster but are only used to supply water lines in irrigation, general water supply, or other non-FM/UL listed applications. Typical Fittings: N9701/9702 hardcoat aluminum expansion (usually NH or NPSH thread) or Reeltex reusable threaded ends. Construction: Tube: Extruded elastomer. Jacket: Red (NL9610/NL9615) or Yellow (NL9620), treated, single jacket polyester. Reinforcement: Spiral helix. Detail Comments: Continuous lengths up to 200ft are available on special request.